Just weeks before the premiere of the final season of Games of Thrones (GoT), Bennett University’s literature club Cerebrum, invited the Thronies to its second GoT quiz on April 3. The idea behind the quiz was to test the knowledge and memory of the Bennett students who passionately follow the series. The event saw an enthusiastic crowd with the participation of more than seven groups. Before the preliminary round, the participants were seen fervently revising their GoT facts. Their nervous chatter and creased foreheads were reminiscent of scenes outside exam halls when students revised from their books till the last minute. 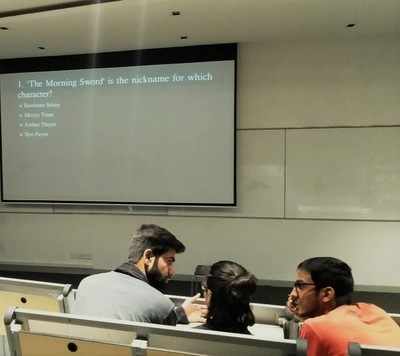 The quiz, held by quizmaster Maninderjeet Singh and Cerebrum’s secretary Rishabh Mishra, was met with an energetic and excited audience who deftly fielded questions with quick and accurate responses. The Thronies, who had been binge-watching the show ahead of the finale premiere, were easily providing answers to the trickiest of questions, without the help of hints or any assistance. As the quiz approached the elimination round, the enthusiasm and the competitive spirit of participants soared. The final round brought about a renewed vigour in the groups. Two groups bagged the highest scores without losing a single point. As the winners were announced, the anxious crowd shouted with glee.